A SCHOOLGIRL who bravely fought a Home Office deportation order at the same time as a crippling genetic disease has died after going back to India. Zarine Rentia, 15, who attended South Camden Community School in Somers Town, lost her long battle with illness last Wednesday at a hospital in Gujarat, India. Teachers and students at the Charrington Street school – where Zarine’s friends campaigned for her to be allowed to stay – broke down in tears when they were informed of her tragic death yesterday (Wednesday) afternoon. They are planning to plant cherry blossoms, Zarine’s favourite tree, at the school in her memory. Zarine had returned to her native country a month ago to be closer to her family after English specialists diagnosed her condition as terminal, just as she and her mother, Tasnim, were on a verge of a landmark immigration ruling. Her family were appealing against a Home Office decision which had ruled Zarine should be deported because her condition was “not life-threatening” when she fell seriously ill.
Medical experts rallied to help her, but were unable to diagnose the cause ?of her deterioration until it was too late. Heart cancer brought on by the ultra-rare Fanconi-Bickel Syndrome (FBS) which Zarine had suffered from since birth was given as the cause of death. 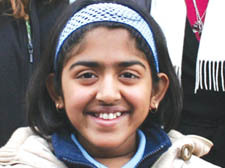 Zarine came to England in 2004 and was diagnosed with FBS. The disease renders bones too brittle to support the body’s weight and causes permanent liver and kidney damage. There are just 112 recorded cases worldwide.